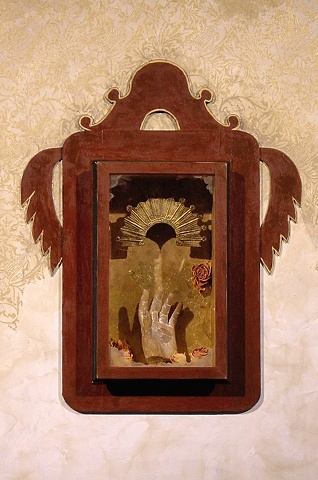 19th c. wood Guatemalan santo hand, early 20th c. Guatemalan painted tin resplandor / nimbus, dried roses, paper, basswood sheet and strips, acrylic paint and acrylic media on archival wood support. This carved hand was once part of a larger wood figure of a saint. One this size was probably from a church. the Hands and feet were often carved separately and added to the figure. Hands and fingers were usually the first parts of a santo to be damaged over time. The nimbus or resplandor was placed on the head of a figure (saint) to show divinity. 24" x 25 1/2" x 2 7/8"